Of course y’all know that I love to cook, but did you know that I’m really not much of a baker? Baked goods kind of make me crazy. All that fiddly measuring and beating and folding. Well, it’s just not so much my favorite kitchen activity. I’d much rather be making a savory recipe, throwing in a dash of this and a pinch of that. So when I do decide to bake it’s usually something easy and quick. Like a one pan cake or maybe muffins or cupcakes. They’re just so easy and simple, you know? 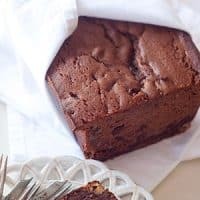 That’s why I thought this Chocolate Walnut Pound Cake would be the perfect recipe for a Valentine’s Day treat. Simple ingredients. Not too much measuring. One pan. How could you go wrong with that? Plus it has a double dose of chocolate. Serve this with a dollop of whipped cream. Or some fresh sweetened strawberries. Or both! Your Valentine will thank you. 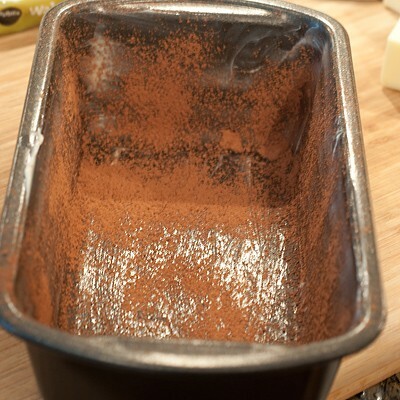 Butter a 9x5x3 loaf pan and dust it with sifted cocoa. Any time you’re making a chocolate cake, dust your pans with cocoa. It keeps the finished cake from having a dusting of white flour on the outside. Just makes a prettier layer. Now cream the butter and then add the sugar gradually. Continue beating the butter and sugar for 5 minutes. Add the eggs, one at a time, mixing well after each addition. In a separate bowl, sift together the flour, cocoa, soda, and salt. Add the dry ingredients to the batter alternately with the yogurt, beginning and ending with the dry ingredients. Stir in the vanilla extract, nuts, and chopped chocolate. Pour the mixture into the prepared pan and bake for approximately 1 hour and 10 minutes being very careful not to overcook. Remove the cake from the oven and let it cool in the pan for 10 minutes. Turn the cake out on a wire rack and allow it to cool completely. 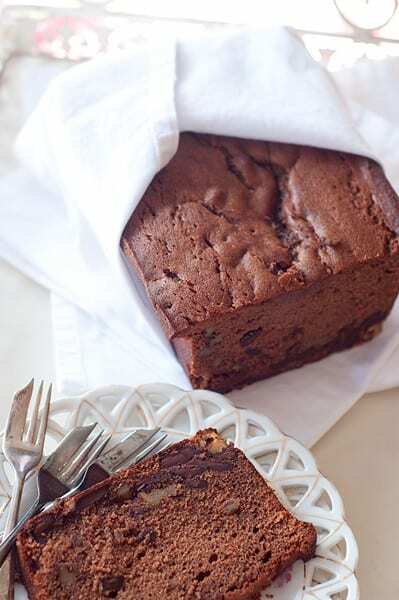 A moist, rich pound cake with walnuts and a double dose of chocolate. Butter a 9x5x3 loaf pan and dust with sifted cocoa. Add the sugar gradually and continue beating for 5 minutes. In a separate bowl, sift together the flour, cocoa, soda, and salt. Add the dry ingredients to the batter alternately with the yogurt, beginning and ending with the dry ingredients. Pour the mixture into the prepared pan and bake for approximately 1 hour, 10 minutes being very careful not to overcook. 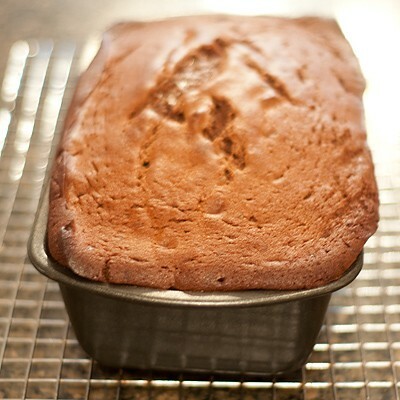 Remove the cake from the oven and let cool in the pan for 10 minutes. Turn the cake out on a wire rack and allow to cool completely. Oh yum, this is my kind of pound cake! Although I’m not a big fan of nuts in cakes, I think walnuts pair perfectly with chocolate! My usual first choice of nut for most anything is pecans, but I do agree that walnuts and chocolate are really nice together. This is the pound cake of my dreams. I love how it looks and I am sure it tastes chocolaty delicious! It’s definitely a dreamy chocolate cake, Mari! This looks yummy. I’ll bet it is good served warm. Great Valentine dessert. Yes, the yogurt really helps keep it moist for several days, Mary. That looks gorgeous, Lana. Love walnuts, especially with chocolate! It looks amazing Lana ! Can’t wait to try it , and I’m sure it will turn out great . That means one whole cup plus 1/3 cup of sugar. My favorite pound cake is Chocolate Walnut pound cake. I have convection oven. I usually bake sponge cakes at 180 degree in 7 inch pan for 30minutes…At what degree should i bake this cake in my 6 inch pan? Hi Asra. Sorry, I’ve never used a convection oven so I’m not able to answer that question for you. I have tried out this recipe and the cake turned out to be simply awesome. I was wondering if I could use 1/2 cup apple sauce and 1/2 cup butter. Would that change the taste and texture of the cake in any way. Beautiful and perfect size cake. I have 2 questions: Can i substitute pecans for walnuts and can I substitute sour cream, milk or buttermilk for the yogurt? I hope you can answer pretty soon because I’m really looking forward to making this cake for my husband. Hello Carol -I think pecans would be a very good substitution in this cake. I haven’t tried substituting anything for the yogurt, but you could give it a try. I’d probably go with the sour cream.